St Bartholomew's school, Quorn, held two harvest festival services on Tuesday, and through them 60 old folk in the village benefited. The first service, for junior children, was conducted by the Vicar (the Rev W E Pilling). As chairman of the governors, he presented the school with a Coronation gift, a lectern carved with the school crest and suitably inscribed, from the County Education Committee. Then, as a clergyman, he dedicated the gift. 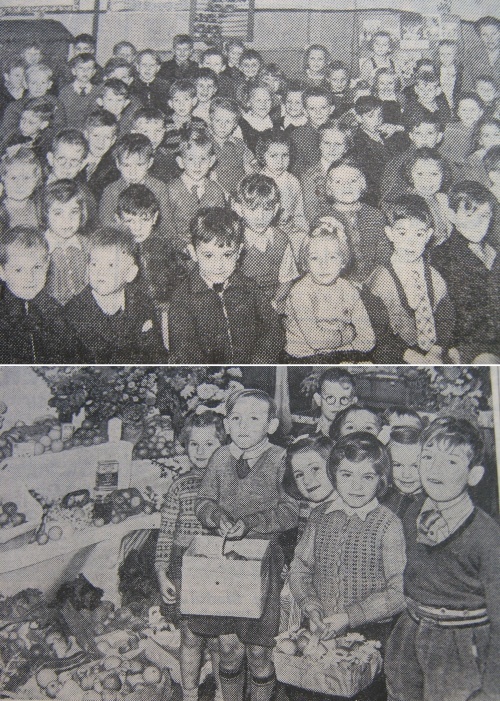 The second service was held in the Infants Department, which was artistically decorated with gifts of fruit and vegetables. The display was the work of teachers, Mrs I Wesley, Mrs E Holmes, and Miss M Bailey. Members of the village's Old Peoples' Fellowship attended this service as guests. Then the headmaster (Mr I S Gaylon) presented the gifts to Miss E Sutton, who, a former teacher at the school, received them on behalf of the fellowship. Later, the school entertained about 60 old folk to tea. The gifts were divided up and shared among them. Missing information: Can you name any of the children in the photographs?